A few weeks ago, I wrote a simple guide to remove and disable the automatic install of Candy crush for Windows 10. It works for other apps like Minecraft, Flipboard, and the official Twitter app. But of course, these apps are not everyone’s cup of tea. I understand that they are some of the most popular apps in all of the major platform, but there are many people who simply don’t use them. This is where this article comes from because in the latest anniversary update build 1067, this registry trick doesn’t work anymore. 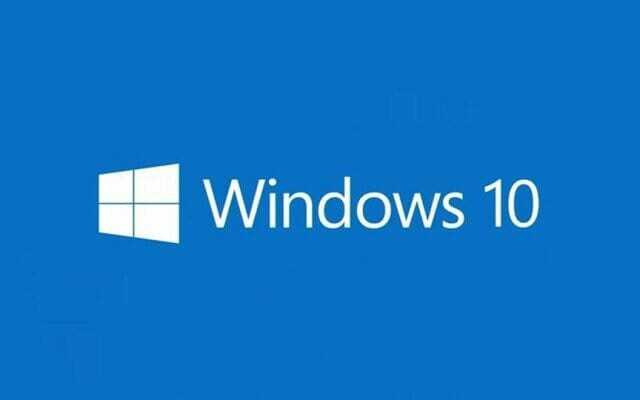 Fortunately, there is another way to disable this annoying behavior of Windows 10. 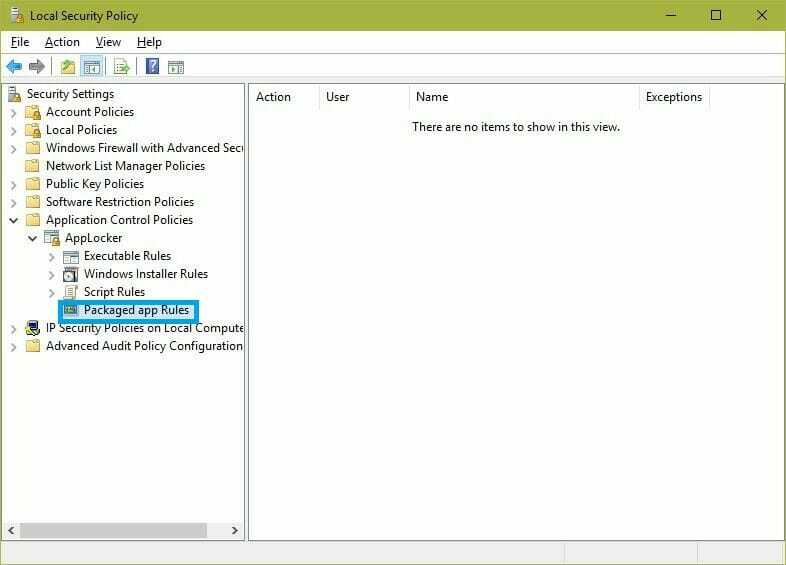 You will have to use the Local security policy editor and create a new Packaged app rule. Press Win + R to open Run box and type secpol.msc. Press enter. This will open the Local Security Policy Editor. In the left gutter, go to Security Settings > Application Control Policies > App Locker > Packaged App Rules. 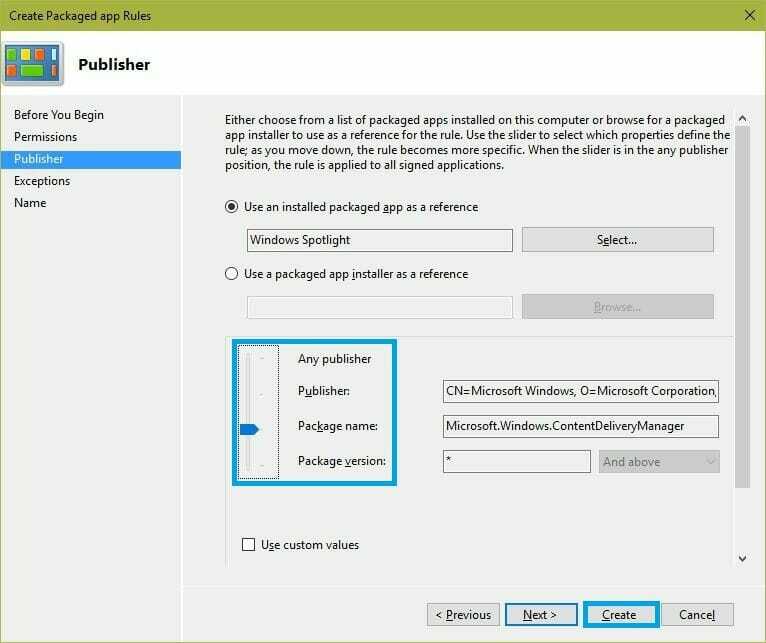 While the Packaged App Rules is highlighted, right-click on the right side view and select Create New Rule… This will open the Create Packaged app Rules wizard. In the first page, just click on Next and ignore the stuff written there. This will take you to the Permissions page which we are after. In the Permissions page, select the Deny radio button below the Action heading. Don’t touch the Group or everyone selection. You will now arrive at the Publisher page. On this page, click on the Select button beside the Use and installed package app as a reference. 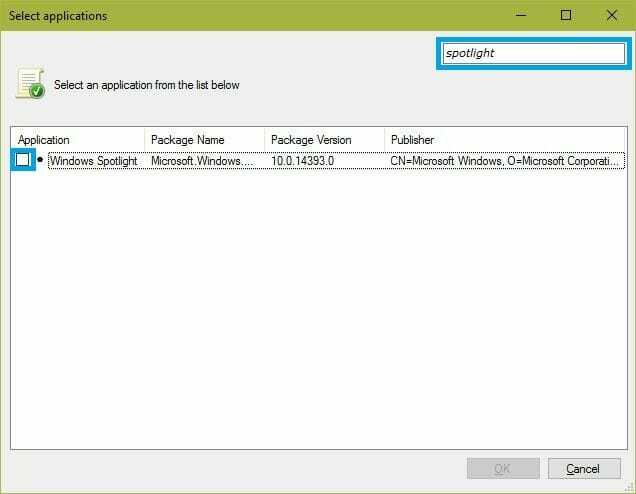 A Select application selection box will open up. Here, on the top right search box, type spotlight. Check the box on the side of the Application name. It will look something like the image below. Click OK. Now move the highlighted slider from Packaged version to Package name as shown in the image. Click on Create. Close everything and restart your PC to apply the changes. One thing that I didn’ tmention above is that the apps installed already on your PC won’t go away by doing the above. For that, you’ll need to manually install them one by one from the Store. The changes you made above will make sure that the apps won’t come back though.